The new fund offer (NFO) is an open-ended mutual fund. It closes on 21 October, but will remain open for subscription even after that. The age limits are just suggestions by the fund house and not limitations; you can be invested in the one plan throughout if you so desire. The fund offers the “auto switch" facility, which automatically changes your allocation from progressive to moderate and then to conservative at predefined periods (age), as per instructions given at the time of application. It offers three free switches. All plans come with the growth option only since the objective is to let savings grow over a long period. Withdrawal: The “auto systematic withdrawal plan" allows investors, who have completed 60 years of age, to withdraw regularly either on a monthly or quarterly basis from the accumulated lump sum. For monthly payments, you can withdraw up to 1% of the market value of the investment on the day you complete 60 years of age. For quarterly payments, you can withdraw up to 3% of the market value of investment on the day you complete 60 years. For higher amounts, you can redeem units separately. 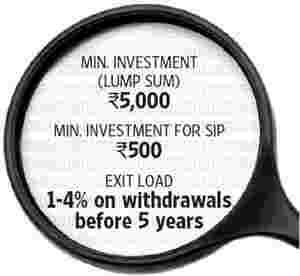 Exit load: There is a diminishing exit load if the fund (any plan) is held for less than five years. Starting with an exit load of 5% if the fund is held for less than a year, the exit load reduces by 1% for every additional year you remain invested. The idea is to encourage minimum investment up to five years. Taxation: For progressive and moderate plans, tax laws for equity funds will apply; for conservative plan, debt taxation will apply. There are other products in the mutual fund space that offer similar solutions. For instance, Franklin Templeton Asset Management India Pvt. Ltd, Birla Sun Life Asset Management Co. Ltd and ICICI Prudential Asset Management Co. have similar funds. But all these are fund-of-funds, that invest in other funds. Also, this NFO has the auto switch and auto withdrawal options. Overall this is a good solution for those who don’t have time to look at their portfolio. But if you are able to manage time even once a year, you can design a portfolio of well-performing funds yourself.